Senator Chuck Grassley’s town hall meeting in Osceola late this afternoon was a prime example of the country’s partisan divide. Grassley, a Republican who has served in the U.S. Senate for 36 years, was greeted with applause when he entered the room. The crowd count was 132, according to a tweet from Grassley this evening. Some sat in an overflow room, observing via livestream. 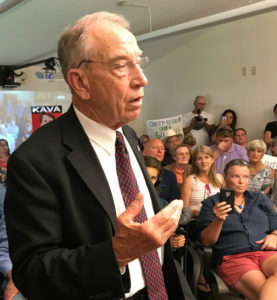 Grassley was asked about tariffs, taxes, criminal justice reform and monopolies, but Grassley’s role in confirming President Donald Trump’s U.S. Supreme Court nominee in the Senate Judiciary Committee was the main flash point. The crowd in Osceola to hear Senator Grassley. A handful of people in the crowd had posters featuring Kavanaugh’s face and the caption “Kavan Nope” as a play on the nominee’s name. As the hour drew to a close, Grassley called on a man who chided opponents of Kavanaugh for “not showing respect” to those who support the president and his pick for the court. The man asked the crowd to recite the Pledge of Allegiance. A few people walked out. A few said: “Take a knee” and knelt in protest. Most stood and recited the pledge. Grassley met a few minutes later with reporters for a debriefing of the event. 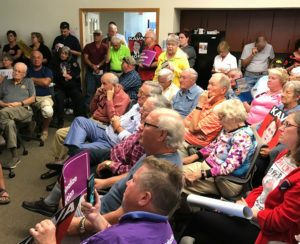 It was the final stop in his “hold-an-event-in-each-Iowa-county” tour for 2018. Grassley, a witness to other moments of national upheaval, predicted this fevered debate will fade — at some point.